1. 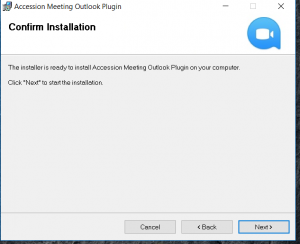 Close Outlook if open, then open the Accession Communicator client and select Tools then Options. 2. Under options, click the “Meetings” Tab. 3. 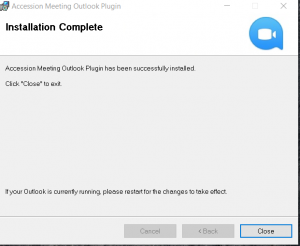 Scroll to the bottom of the options page and select “Download Outlook Plugin” under Outlook Plugin. 4. 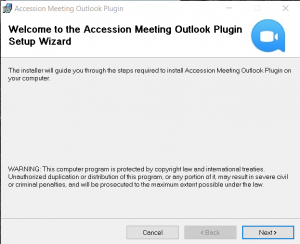 Save the installer package, then go to your downloads to run it. You can run it from here as well if you are given the option to. 5. The Wizard will now run through the installation steps. Click Next. 6. You can keep the defaults and click Next through the next 2 pages. 7. The plugin will now install. Click close to finish. 8. 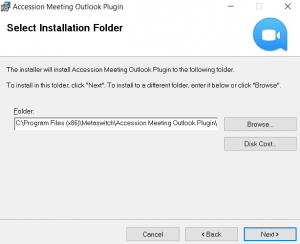 Now open Outlook and you should see the Accession meeting plugin under your Home Ribbon. If there are any issues, please feel free to contact 1-(844)-462-4625 for assistance.